BroadLink® RF-IR Blaster Automation Hub: Need an easy phone app system? Take a look at our affordable blind and shade hub, operated by Android and IOS apps. 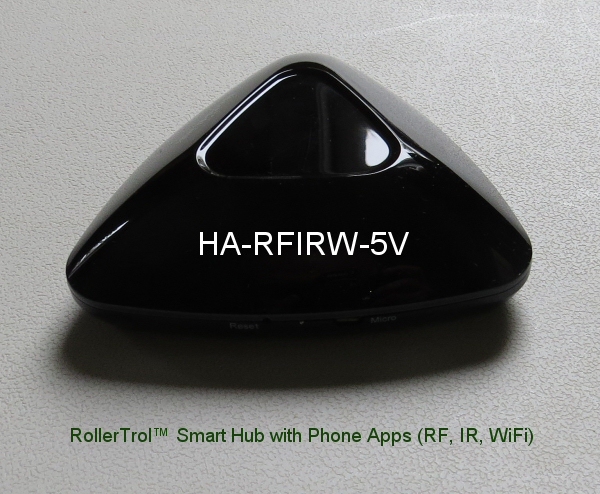 This RF-IR blaster hub can "learn" RF radio signals for our blind motors and skylight/window openers! It is also has IFTTT event triggering (if-this-then-that) and IR learning. We're giving away a free BroadLink® Automation Hub, read on for details about our Christmas special ... . If you want to take it even further and add support for Alexa®, take a look at the Node-RED visual design system for home automation. 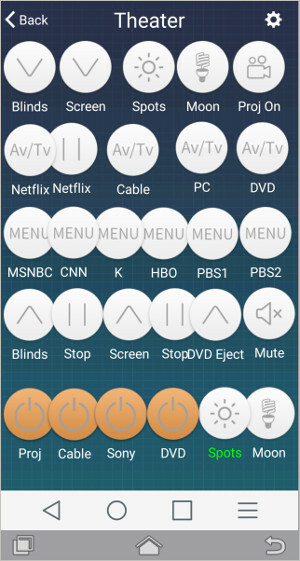 Built into the Raspberry Pi operating system, it is a very rapid way to control blinds and build a home automation system that runs on any platform (Raspberry Pi included) and supports literally hundreds of devices, including our blind motors and skylight/window openers via the BroadLink® plug-in. It has always been our policy to support as many home automation and IoT systems as possible. We often get requests for a simple, affordable phone app, and we think that solution has finally arrived in the form of the new hub from BroadLink®. It has quickly become our hub of choice for a number of reasons. Unique among controllers, one of the most important features is its ability to "learn" RF radio commands. This means it can directly control our radio motors, whether they are our new G series radio motors or the older R series motors. It can also control our skylight/window openers, our smart film, our drapery motors, and many other devices, such as fans, LED lighting, etc. It can even learn x10 radio commands, in case you have a few of those old modules in your home. 5 or more DIY motors and actuators. This can be a combined order of different blind motor sizes and/or skylight/window openers. The following is a brief repeat of our main article series about the hub. If you want to jump straight to the artice series, please see the link at the bottom of this page. It is also an excellent IR code learner too, for controlling all your Netflix streaming, TV, sound and other media systems. With the ability to chain events to a single button press, you can very easily set up a sequential process for some application in your home. You can create a series of button controls for your home, quickly from scratch, even quicker if you use the available existing templates. Once that is done, you can share your remote control system simply by cloning it to any other phone on the local network. You can also upload it to the cloud to support family or clients in remote locations. If you have an old tablet or phone, you can quickly convert it to a sophisticated remote control. The app will work on fairly old phones too, without a SIM card (as long as the WiFi section still works). You can easily extend operation to your PC or laptop by using a 'phone cloner' that puts your phone screen onto your local machine screen, using mouse clicks to simulate button presses. We used the excellent Seven Square program to display our Android phone screens on our local Ubuntu laptops via a USB connection. There are similar programs for Mac, Windows, and IOS. It doesn't fall short on the sensor side either, with capabilities for detecting environmental conditions such as temperature, humidity, air quality, smoke detectors, etc. It also has security accessories for detecting door/window opening, motion, and other events that fall into the security realm. Ability to expand capabilities with 3rd party software such as Tasker, an excellent Android app, with remote access capabilities. Please see the full article series A Really Smart Automation Hub for further information. If you are interested, you can also purchase these products in our DIY online automation store.